So, can we change your mind? Home / Tools/Resources / So, can we change your mind? So, it seems that you’ve decided to leave your shopping cart without joining our members site, or buying our tantalizing piece of art titled, The Plan of Attack, huh? Boooooooooooo! Hissssss! JUST KIDDING! We are actually immensely appreciative of you for stopping by, and giving serious consideration to purchasing theChristiandude.com membership, or our The Plan of Attack. Similarly though, we’re sad to see you not become a member of our community in some way… any way! Thus, we would love an opportunity at impressing you, not with all the words and pictures on our membership sales page, but by getting an actual product in your hand for a price you can’t pass up. 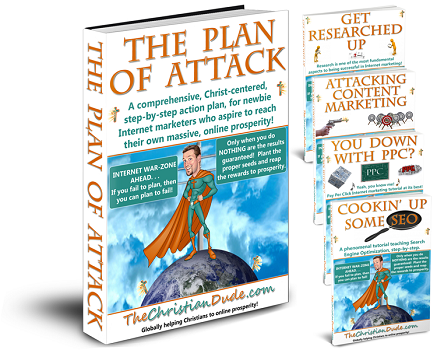 By now, you’ve probably read a little about our powerful and thorough tutorial, which is a 30 day action plan to making your first dollar on the Internet, while sowing the seeds for a long-term business and full-time income from a Christ-centered perspective… The Plan of Attack. With well over 200 pages of content, and task-specific items to actually get you “doing” versus always studying, finding, or reading, it is not only a short term solution to putting a little extra prosperity in your future, but a long term approach in giving yourself the possibility of honest-to-goodness, annual, six figure prosperity. Most importantly, it comes from an approach of faith in Him, belief that prayer is important in all things, and belief that working with fellow Christians as mutual accountability partners helps us stay focused and resilient to the attacks of the enemy. Saying it more concisely, we are the only Internet marketers community in existence, whom is growing a social network of Christian Internet marketers. Most Christians do not know how to effectively go out into cyberspace, and deliver messages that will be heard by the masses, instead of being read by a select few who “stumble” across their resources. We want to equip Christians with the knowledge of how to get their message, their Christian product, their testimony, their Christian music, or whatever, to the masses. 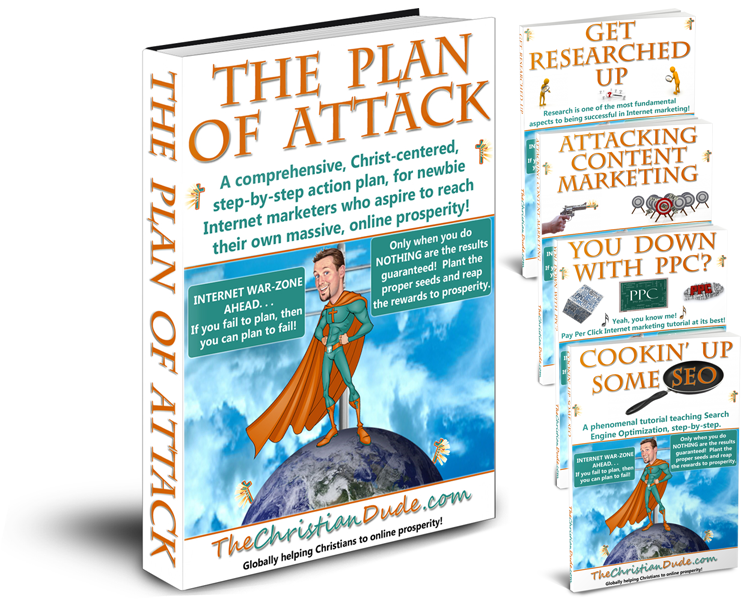 We are currently selling The Plan of Attack for $59, but today we are willing to extend our ultimate, “getting started”, action plan to you for a one time charge of only $34.95. PLUS, if you ever decide to take the step to becoming a member of our Christ-centered product hub and community, you can provide your receipt for this purchase to receive a $20 discount on future membership! If you are ready to begin your journey to prosperity, but simply weren’t ready to commit to the ongoing, monthly charges (despite the amazing value at theChristiandude.com ), we completely understand! Some people feel the need to crawl a little before they are prepared to fly! So, if you can commit to a one time fee of $34.95 for our ultimate tutorial, simply click the buy button, below. GOD BLESS YOU, and thank you for this opportunity!! !